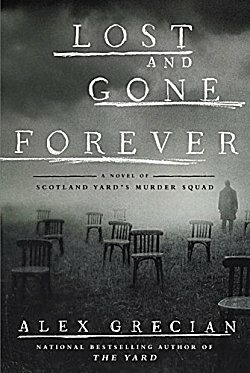 Many changes have occurred at Scotland Yard's Murder Squad in the past year. Scotland Yard is now in a new building. Sergeant Nevil Hammersmith has lost his job and set up his own private detective agency. Claire Day is trying to raise her family by writing because her husband, Inspector Walter Day, has been missing for this entire length of time. No one knows where Day is, although some have suspicions that Saucy Jack (AKA Jack the Ripper) has him. For Hammersmith, finding Day is his one and only case-- although one of the women working for him have other ideas. What Hammersmith doesn't realize for quite a while is that he isn't working alone. There is a pair of bounty hunters on the lookout for Jack and Walter, and Nevil should be worried. I've been reading and enjoying Alex Grecian's Murder Squad series since the very first book, The Yard. Grecian has created several marvelous characters, and it's easy to become irritated when you feel that they all aren't getting their fair share of time in the spotlight. And that can happen here. Points of view can change from one book to another as a certain character takes charge of the narrative. Relationships shift... and bad things can happen. Bad things have been happening to Walter Day for an entire year. He's been held captive by Jack the Ripper, and if you're afraid that Lost and Gone Forever's gore factor is going to be too high for you, or that you just don't want to read scenes of torture, you can rest easy. Grecian does something much worse (in my opinion) than describing gore and torture: he lets your imagination fill in the blanks. Toward the end of Walter's lightly described time with Jack, Jack looks at Walter and makes the comment that he's broken his favorite toy. I don't know about you, but my imagination can fill in a lot of blanks with that one short sentence. It's so tempting to talk more in depth about the plot of this book, but I don't like giving things away, so let's talk about more general things. There are quite a few plot threads in this book, and sometimes it seems as though they jostle each other for space. Did I find it confusing? Not at all. I just admired Grecian's ability to keep everything straight. Throughout the book, Claire Day was working on a children's story, and we were treated to excerpts from it. Something tells me there was supposed to be some symbolism there, but frankly the story almost bored me to tears, and I skimmed through those sections quickly. I probably missed something important, but I have yet to feel any real remorse. I've always found Alex Grecian's writing to be very visual, very imaginative, and his pacing and characterization are wonderful. If you're new to this series, I do suggest that you start at the beginning with The Yard because, as I said earlier, characters grow and change, things happen to them, relationships shift... and that information will be invaluable in later books. Be warned: these books read quickly, and they are very addictive! Historical novels like this one really appeal to me, Cathy, when they're done well. And there's just something about London, isn't there? Little wonder you enjoy these novels. Grecian has created characters that I really care about.